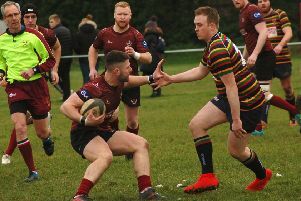 Melton RFC First XV’s woes continued as they were once more without a raft of injured or unavailable senior players for their heaviest defeat of the season. 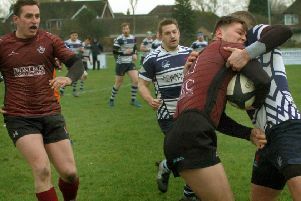 Despite the enthusiasm and willingness to play, Melton’s desperate need to add experience to the flair and exuberance of youth, was underlined by the 81-7 home reverse to West Bridgford. Captain Leon Gormley continued to put in superb performances and on Saturday was aided by a stand-out contribution from Ollie Circuit whose kick-chase game looked better once again. In the second row, Pete Clarke made several big tackles and carried well in traffic, while Tom Allen popped up all over the field, carrying, tackling, clearing rucks, and sending grubber kicks into space. His reward came when he finished off a brilliant tight passage of play, getting the touch down for Melton’s sole try. Melton again started brightly, but Bridgford had too much knowhow, exploiting space out wide, and running in six tries with four conversions to lead 38-0 at the break. Many teams could have packed up, but to their credit, the home side stuck to the task and despite conceding two further converted scores, they brought on Dave Meakin. His physicality and experience, albeit for 10 minutes, illustrated what Melton require on occasions – direct, straight running rugby. After eight phases starting on the halfway line, Melton carried well through Meakin, Clarke, Gormley, Luke and Jordan Pawley before Archie Hutchinson finally popped a pass to Tom Allen who crashed over. George Morgan-Jones added the touchline conversion and Melton had the consolation of seven points on the board. At 52-7 down Melton had 10 minutes of good rugby, but losing both Meakin and Harry Wood to injury, and Luke Pawley rather harshly to the sinbin, put them under the cosh again. Bridgford capitalised, adding a further four converted tries before the final whistle. Once more, the opposition were good, but not brilliant, and Melton just need to find a way of keeping the ball and keeping players fit and on the pitch. On Saturday they entertain Northampton Old Scouts (kick-off 2.15pm) when all support will be welcome.